The Scottish Police Force, still outside the Association should be approached with a view to getting them into line with those forces affiliated with the SAAA. That an endeavour be made to persuade the Executives of Highland Gatherings to hold their sports under SAAA laws. To circularise all Higher Grade and Secondary Schools to hold sports wherever practicable and to send a similar circular to clubs whose one time annual sports have been allowed to lapse. Athletics clubs generally were picking up the reins after having closed down for the duration of hostilities. Clubs in existence before 1914 had suffered terrible depredations – many members had been killed in action, many who had survived the war found facing the empty pegs in the dressing rooms too much to face. On the other hand some clubs emerged from the war relatively unscathed and many new clubs sprung up. 1919 was the first real test of the athletics community’s will. The recommendations were clear enough, the desire to get the sport moving at national and club level was evident so it is worth looking at what the sport looked like in 1919 for the average athlete. The first SAAA championship after the War was the 10 Miles track championship held at Celtic Park on Saturday 5th April when there were 15 entries but only 12 starters. One of the absentees was George Wallach. It was nevertheless a good race with W Ross of Edinburgh Northern Harriers winning from James Wilson of Greenock Glenpark with Dunky Wright third. Edinburgh Academy Sports were held the same day at Raeburn Place and a full programme of events was carried through. On May 3rd in 1919 there were two meetings held and they were both connected with schools – the Glasgow Academical Club had their annual sports day at Anniesland and Dollar Academy had theirs at the school. The former for the first time since 1914 events for Academicals (Academicalss were Former Pupils)were included in the programme. There were seven track events – 100 yards, 120 yards hurdles, quarter mile handicap, mile handicap (all for the school), 100y handicap, 200y handicap, half mile handicap for the Academicals as well as throwing the cricket ball, broad jump, high jump, tug o’war and inter-house relay. There was also a place kick competition. Dollar, which took place before a ‘large and fashionable crowd;, had a more extensive programme with more variety in the events – eg as well as the place kick, there was a drop kick competition, there were also the old stand bys of sack race and obstacle race and more ‘normal; athletics events included 100y, 220y, 120y hurdles, quarter mile, half mile, mile and relay as well as high jump, long jump, putting the weight and tug o’war. There were also events held at Powderhall on the same day where the professionals in action included the very well known George McCrae who was scratch in the distance events. The following week, 10th May, it was the turn of two more schools – the Royal High School held their sports at Corstorphine, and Stewart’s College held their event at Inverleith. Royal High had ten events for pupils and two for former pupils – the ten included throwing the cricket ball and the drop kick 100 yards, 120y hurdles, quarter mile and relay with putting the weight and long jump. What they had that most others did not, was standard times and distances for all events. Stewart’s had results listed for the events counting towards the school championships plus an open mile handicap. They also had two events for FP’s and there was also a 300 yards race open to members of the FP’s football club. Incidentally, these events were actually listed as ‘for FP’s’. Again there were events held that day at Powderhall but no amateur meetings. The Inter-Scholastic Sports were held on 17th May at Inverleith and organised by the SAAA. The Inter-Scholastics were the early form of what is now the Scottish Schools Championships. Events were in three categories – Under 14, Under 16 and Open. On a wet afternoon, eighteen schools took part – two more than the previous highest number, and there were some good performances. The most notable was Dollar Academy’s high jumper RD Watt winning the high jump with 5′ 3 1/2″. The events for each group included 100 yards, 120 yards hurdles, quarter mile, mile, relay (both won by Royal High) throwing the cricket ball, putting the weight, high jump and long jump. Kelvinside Academy held their own sports that day at Balgray with all the above events plus the drop kick and a mile handicap. In the relay Blue House won from White House. The professionals were in action at Powderhall where there were 30 preliminary heats of the 130 yards handicap with the limit being 29 yards. With the schools’ sports pretty well all over, it was the turn of the clubs and senior athletics to take the stage and on 24th May the biggest was that of the North British Diesel Locomotive Association to hold their meeting at Scotstoun Showground. Not just athletics, but also boxing, wrestling and highland dancing were on the agenda with 100y, 220, 880y, mile handicaps, relay, Hammer and tossing the caber making up the athletics programme. There was also a five a side of course which was won by St Mirren who defeated Dumbarton 4 – 0. The relay was won by Edinburgh University from Bellahouston and Shettleston. The other meeting was the annual Glengarnock Sports organised by Eglinton Harriers. They too had a mile relay which was won by Maryhill from Shettleston and Eglinton Harriers. The programme had 100y, 220y, half mile, two miles, invitation 75 yards and invitation Mile. The professionals were at Powderhall with 24 preliminary heats of the 75 yard dash plus a one mile handicap. On 31st May there were enough meetings to suit every taste. Edinburgh University held their sports at Craiglockhart with school championship events plus some open events including a medley relay which was won by the Maryhill team of Dallas, Goodwin, Hamilton and Colberry from Shettleston and Edinburgh University. Dallas also won the open half mile and the University championship was won by WI Watson by ‘a huge margin.’ Meanwhile in the West, Vale of Leven held their meeting with three 100 yards races (boys, open handicap and confined to football players), relay race (won by Bellahouston from Clydesdale and Dumbarton), 220y, half mile and mile (all handicaps), and a five a side won by St Mirren over Dumbarton Harp by 1 goal + 1 corner to one goal after extra time. All the solid club runners were there, the men who turned out every week and won handicap prizes almost every week – HJ Christie (West of Scotland, S Small (Bellahouston), D Martin (Maryhill), McIlree (Garscube). The St Vincent Home had sports at Celtic Park in front of 3000 spectators and was notable for the five a side result where Clydebank defeated Celtic by 1 goal to nil. George Heriot’s School held their championships and events open to FP’s at Goldenacre. Bellahouston Academy held their championship meeting at Ibrox Park where G Drummond won four of the five events contested for the school championships. And of course there were multiple heats (26) of a sprint (100y) at Powderhall where G MacCrae was scratch man in the two miles – unplaced behind the winner who won £7 running from the 450 yards mark. June is always the high spot of domestic athletic competition and the month started in 1919 with the Queen’s Park Sports – “Queen’s Park, probably the outstanding organisation in amateur sport in the country, resumed the function of sports promoters on Saturday after a lapse of nine years. This fact has aroused the keenest anticipation as to the quality of the fare, and possibly high expectations led to disappointment at the end of proceedings. The various events failed in intensity and the whole competition did not get beyond the commonplace. … ” So started the Glasgow Herald review of the meeting. The actual sports inside Hampden had several very good races such as the medley relay won by Maryhill Harriers from Edinburgh and Glasgow Universities. Largely down to George Dallas on the first (half mile) stage, the report referred to the passing of the ‘silken token’ – a baton is not usually referred to as a ‘token’ and it is certainly not ‘silken’ – which was not described further. Further west, at Boghead Park in Dumbarton, Bellahouston Harriers and Dumbarton FC hosted their own sports meeting. Ayr Academy Sports were held at Somerset Park. The school championship included, as well as the drop kick and throwing the cricket ball, a golf drive competition. There were also events open to FP’s at this one. Back in Glasgow, Shettleston District Schools had their own meeting at Celtic Park. There was no drop kick, but there was a place kick competition and the relay was invitation and won by Whitehill School. Interestingly, the competitions were divided into Higher Grade and Lower Grade reflecting the academic and non-academic split in education where the brightest pupils all went to the Higher Grade Schools. Still in the west, the annual sports ‘connected with’ Larchfield School took place at Helensburgh where, in addition to school and old boys events there were two extra competitions for boys from the local naval training school. There was also a ‘Sisters Race (Senior) on the programme and Larchfield was the only school which incuded the Hammer Throw on the programme. Were all the less usual events put together we could have had a programme including place kick, drop kick, throwing the cricket ball, golf driving, races for sisters and throwing the hammer. The Ardrossan Academy Sports were carried through at Saltcoats and the Bedlay Games programme included one, two and three mile bicycle races. Bedlay Colliery was situated in the Chryston part of North Lanarkshire. There was a professional meeting at Hawick, as well as the weekly meeting at Powderhall. So ran the argument that persisted from the 1880’s right up to the 1960’s. Emmet Farrell argued against it in the ‘Scots Athlete’ in the 1950’s for example. The fact that many of the sports meetings at the start of the last century were organised by football clubs made the event pretty well mandatory! There was also a meeting at Clydebank “with a pronounced football flavour.” Eight teams took part in a five a side tournament and there was also a wrestling tournament which further removed the event from the usual athletics meeting. Across the country a meeting was organised by the Edinburgh Institution, Cambuslang Rangers held a sports meeting at Somervell Park and in Dumbarton, at Boghead Park, the Works Athletic Section of Babcock & Wilcox held their own meeting with a proper athletics programme and a five a side match between Dumbarton and Vale of Leven. The Selkirk Common Riding held a well attended sports day where the main item of interest was a three miles challenge race between George MacCrae (Banknock) and H Malcolm, the Powderhall Marathon winner. MacCrae won. There were also sports held at Scotstoun where the principal items of interest were a wrestling competition and a five a side tournament. There was a total of eight meetings held that weekend. Note that we are talking about a junior football match here – what would have happened had it been a senior game. Note too that we are talking about the month of June – whatever happened to the close season? The Herald itself said that it is difficult to associate football with the longest day of the year. The two teams were Rutherglen Glencairn and St Anthony’s. ‘Upwards of 40,000 spectators’paid £1400+ to see the 1 – 1 draw. The meetings held on the twenty first however were good ones. Clydesdale Harriers held their annual sports at Ibrox before 3000 spectators and revived the 440 yards race which had been popular several years earlier. The fashion had been for most sports meetings to have two sprints – 100 and 220 yards – and two distance events. By re-introducing the quarter, two new combinations were opened up to athletes – 220/440 and the quarter and the half double. There was also an amateur boxing final between J Brown (Hamilton Amateur Athletic Club) and J Johnstone (Parkhead School of Physical Culture). Brown won. Meadow Park, Dumbarton was the scene of an athletic meeting held by Dumbarton Harp FC, Lanarkshire Constabulary held a sports meeting at Fir Park, Motherwell and a meeting in aid of the Sick Children’s Hospital Fund was held at Tynecastle in Edinburgh. This last included a one mile relay race – interesting because there would be one for the first time at the SAAA championships the following week – which was won by Edinburgh University from Maryhill Harriers. The Clydesdale Harriers meeting was the only one without five a side competition. At the championship the following week, there was an attendance of ‘almost 4000’ compared with the Junior Cup Final across the city (Rutherglen Glencairn won 1 – 0) where the crowd was estimated to be 35,000. It was nevertheless a good meeting and Maryhill Harriers won the relay championship from Greenock Glenpark Harriers whose half miler Sgt Hector Phillips not only won the 880 yards title but led off the relay race finishing one place ahead of George Dallas in both. The only other sports held that day was organised by John Brown and Company in Clydebank before ‘ a large crowd’. A week later and all the top talent went to the AAA’s championships at Stamford Bridge but there were several good meetings in Scotland. Kilmarnock FC held theirs at Rugby Park and featured ‘competitors of the best class’ including several of the newly crowned Scottish champions. 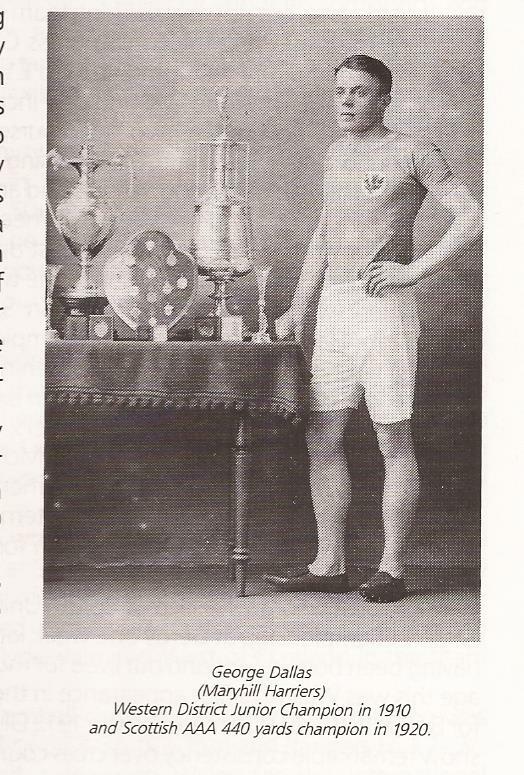 The best performance however was probably that of George Dallas who won the half mile in 2:00.2, apparently with plenty in reserve. The biggest event however was the first Glasgow Police Sports to be held under SAAA laws: here there were 15,000 present to witness the proceedings but the absence of the back markers who were all in London detracted somewhat from the attractiveness. There were events for 14 to 16 year olds, 16 to 18 year olds, 18 to 21 year olds, and Over 21’s. It seems a pity that events like this have no place in present day sporting circles. There was also a sports day at St Ninian’s, Stirling, which had some athletic events but there were 14 teams contesting the five a side tournament … The Nobel Explosive Works held sports at Saltcoats, Games at West Calder and also at Kirkconnel, all attended by ‘a large crowd’. There were six meetings in all as well as the professional events at Powderhall. The quality was as high as could be expected after the war with the handicap 100 yards being won in 10 seconds (McTaggart of Shettleston off 7 1/2 yards, and the invitation race in 10.2, Cook of Maryhill off 1 1/2. The half mile was also a close run thing with George Dallas leaving his run late and finishing second to clubmate JW Riach. Other meetings that day included Irvine Harriers Meeting before a crowd of 5000, and in Edinburgh at Tynecastle ‘under the auspices of Heart of Midlothian FC and the harrier clubs of Edinburgh’ a very successful sports meeting was held. At Shawfield in Glasgow William Arrol and Co. held their sports and one of the attractions was a wrestling display in which D Munro (10 stone wrestling champion of Scotland) undertook to throw M Martin and James McNair in 15 minutes. He threw in five minutes and McNair in 2 minutes 30 seconds, after which he gave a demonstration of ju jitsu. This is of interest in that sports promoters were always looking for ways to bring in the crowd – 5 a sides, lifeboat demonstrations, boxing matches, etc were featured on many programmes. In addition there were Highland Games meetings at Crossford, Saltcoats, Alva and Blantyre Celtic FC also had a sports day. Eight meetings, all successful within their own terms on the same day. 19th July saw a series of meetings of which the Ayr United Football Club’s was, with 10,000 spectators the most successful. It was well supported with Dunky Wright of Clydesdale Harriers running and the all-conquering Maryhill Harriers relay team competing. The Royal Navy Torpedo Factory had their sports at Battery Park in Greenock and George Watson’s in Edinburgh, Morrison’s Academy, Sanquhar, Dysart, Arbroath and Montrose all had their own sports. Aberdeen Harriers had a well supported meeting (5000 crowd) but almost all events were won by athletes from the central belt: 100 yards Stracham from Dumbarton, 220y Strachan; Half mile Williamson of Motherwell; Mile Williamson with virtually all second and thirds coming from Kilmarnock, Glasgow YMCA and Maryhill. There was also a Masonic Lodge (Paisley St Mirren No 129) at Paisley which was restricted to a five a side competition, a place kick competition and a footballers 220 yards. Greenock Glenpark Harriers meeting was undoubtedly the big one the following week with a crowd of 7000 and competitors from England, New Zealand and Canada “whose running imparted distinction to the meeting which otherwise could hardly have reached the standard usually associated with Greenock.” The club had taken advantage of the war and invited the ‘Colonials’ to take part. Eglinton Harriers had their sports at Victoria Park in Saltcoatsbut could not compete with the meeting at Greenock. Meanwhile Clyde had their annual professional sports meeting at Shawfield before 20,000 spectators. A Black Watch meeting at Thornton, Kilsyth Games, and West Calder Games completed the day’s activities. 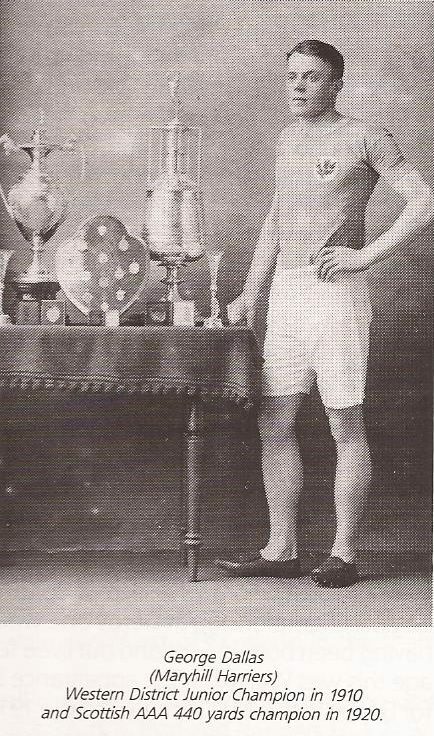 The Rangers FC Sports on 2nd August was described as ‘one of the most successful ever with one English and three Scottish champions taking part in front of a crowd of 15,000 spectators. 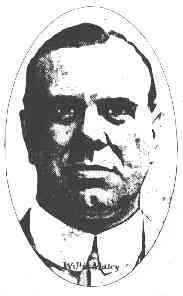 The Englishman AG Hill was the biggest name on display. In the half mile he won his heat without effort, in the final against the second heat winner Sgt Mason of the New Zealand Army, he let Mason (off 5 yards) lead the whole of the first lap and Hill only went in front 50 yards from the tape. George Dallas, running from 25 yards did not make the final. 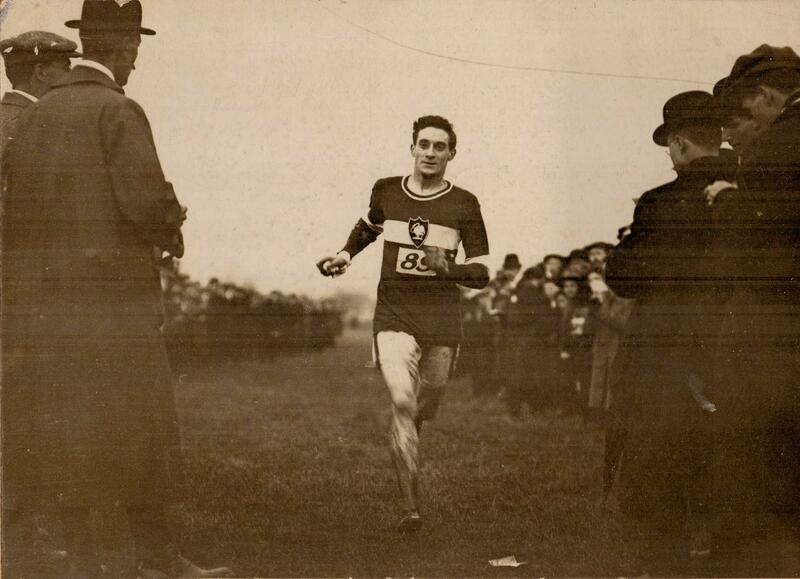 The mile was won by WB Ross of Edinburgh, the Scottish champion There was a sports meeting held at Holytown in connection with a war memorial for the fallen, and the Strathallan Meeting at Bridge of Allan was, as always a success. On 9th August the Celtic Sports were held at Parkhead and there was a huge crowd of 30,000 spectators. Several of the Englishmen entered did not turn up, or did turn up and not run in the invitation event. Hill did not run in the invitation half mile where Sgt Mason lowered the national record and Hill turned out in the open mile where he set a new mile record. Mason had an allowance in the half of 10 yards but preferred to run from scratch and took 0.4 from Homer Baker’s 1:55.8. There was also a first in the mile relay – the Maryhill team having a 45 yards start on the Polytechnic team – which was won by the English squad. Good as it was, the Celtic meeting was not the only event that day in August. On 15th August there were local Games and Sports hosted by Ardrossan Winton Rovers, The Buchan Gathering (crowd 9000), Cambuslang Highland Gathering, Tarbrax Games, Cleland and Crieff. Not all were amateur but the appetite of the public for athletic sports was obviously still there. On the 22nd there were meetings at Glenisla, Strathardle, Laurencekirk (4000), and of course Powderhall. These were largely local occasions with Solo Piping and Pipe Band competitions, five a side between local teams and highland dancing. The war had taken its heavy toll of athletes – running, jumping, throwing had all lost fairly large numbers as had the minor events on the calendar. The sport itself however continued with the Partick Thistle, Clyde, Queen’s Park, Rangers and Celtic all restarting their large meetings and works such as Babcock & Wilcox promoting their own events. While the SAAA and Maley’s Committee were pointing the way forward.